It is frequently stated in the class action literature that many Rule 23(b)(3) class action plaintiffs recover only a fraction of their claimed losses in settlement. Class action critics blame these low recovery-loss ratios on two underlying problems: strike suits, in which the plaintiffs’ claims lack merit and are settled for their nuisance value along with a payment of attorneys’ fees, and sweetheart deals, in which the plaintiffs’ attorneys undersell even meritorious claims in settlement in exchange for guaranteed attorneys’ fees. Critics blame the functional absence of the plaintiff in Rule 23(b)(3) class actions for these phenomena: a passive plaintiff class frees unscrupulous plaintiffs’ attorneys to act in their own, rather than their clients’, interests. Critics propose to stop class action strike suits and sweetheart deals by giving these absent, passive clients a greater role in Rule 23(b)(3) litigation, by switching the way that plaintiffs join a case from opt out to opt in. Though this is a prominent proposal for class action reform, the workings of an opt in requirement have never been studied in an actual opt in regime. 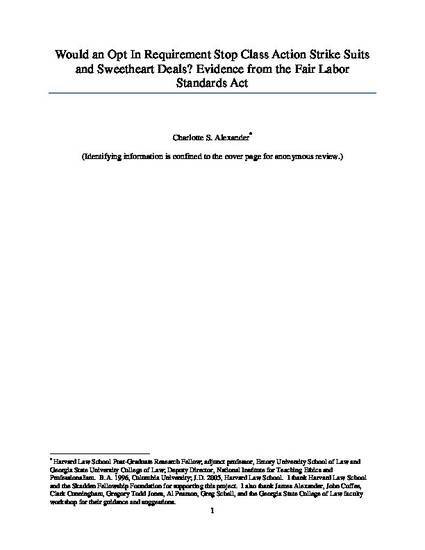 This article begins to fill that gap by investigating whether the opt in requirement of the Fair Labor Standards Act (FLSA) has stopped strike suits and sweetheart deals in cases brought under that statute, ultimately producing higher plaintiff recoveries. The article concludes that the opt in requirement has not had the effects in the FLSA context that class action reformers would hope, and closes with alternative suggestions for reform and directions for future empirical research.